Today I added the below painting and caption to both the Trombone History Timeline and the Alto Trombone History Timeline. Among other things, the engraving on the bell is quite detailed (click on image to expand). Notice also that the trumpet, which carries different symbolism from trombone, is located on the other side of the man, with the battle armor. The painting bears a resemblance to another mid-century Italian painting, Young Musician Playing a Viola da Gamba, by Francesco Mola, in which a small trombone is shown among several other instruments near the foot of the painting’s primary subject, who is standing. The reader will recall that, according to Praetorius (1619/1620), the alto trombone is pitched in D and is called trombone picciolo in Italian (for other examples of this terminology (piccolo/picciolo/picciola), see the following entries in the Alto Trombone History Timeline: 1593, 1594, 1619, 1648, 1703). 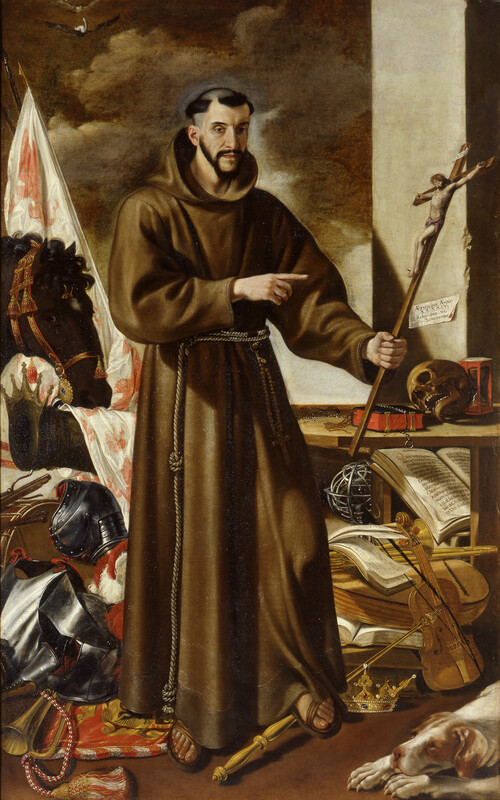 c. 1650—Padre Giambattista d’Este, gia duca Alfonso III, a painting by Matteo Loves, includes what is probably a trombone (bottom-right of full image) among a number of other musical instruments. 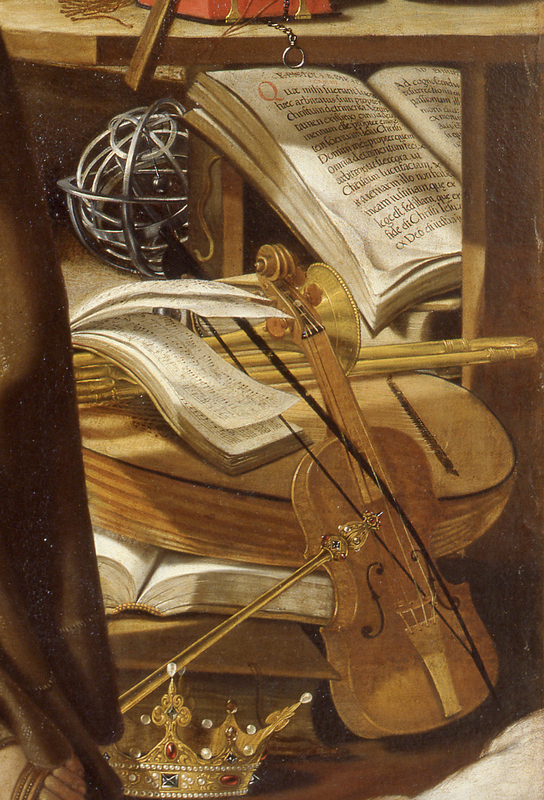 Judging by the size of the objects around it (lute, violin, music book, text book), the instrument appears to be of alto trombone size. There is some extra tubing on the back bow of the instrument (see detail and full image below; public domain) (Galleria Estense, Modena).